When I was a kid, sloppy joes weren’t just some lunch lady land fantasy. Na na naw, sloppy joes were a common meal whipped up on the regular. I’m not sure if this meal defies generations or is a phenomenon of ‘80s, but there was definitely a certain sort of rebellion about sloppy joes that was extra exciting as a kid . The recipe has the word sloppy in it for starters – and it mimics a hamburger but tastier, with its tomato-based sauce and savory spices. As an adult, they’re equally appealing with that easy-to-make and rewardingly messy to eat kinda vibe. It’s nice to get outside the lines as an adult, when things often feel more carefully crafted. It’s also fun to put an adult spin on the rebellion I felt eating joes as a child by veganizing them as an adult. 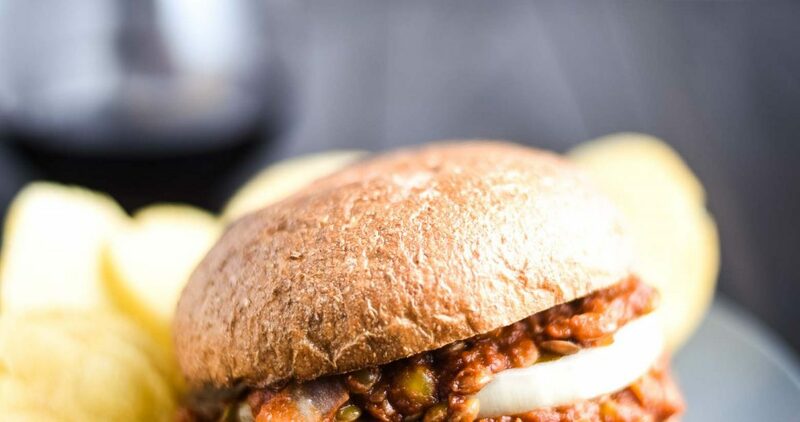 These vegan sloppy joes are an upgrade to the classic. Take a trip down memory lane with me. 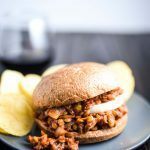 how do you make vegan sloppy joes? Traditionally, sloppy joes are pretty straightforward – crumbled beef, tomato sauce, and hopefully some spices to liven it up. This recipe follows the same successful formula but substitutes lentils for beef, so you’re getting a healthier version of protein. In addition, this recipe spice heavy, which puts a ‘yum’ in place of what might otherwise be just another shoulder shrug. To make vegan sloppy joes, start by cooking the lentils. 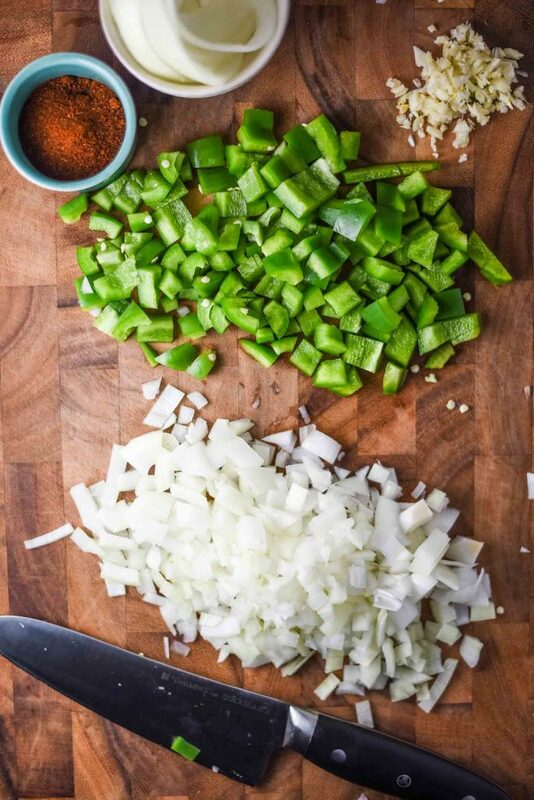 While they’re cooking, sauté the diced onion, garlic, and green pepper in a large skillet. Once the veggies start to soften, add in the tomato elements and spices. 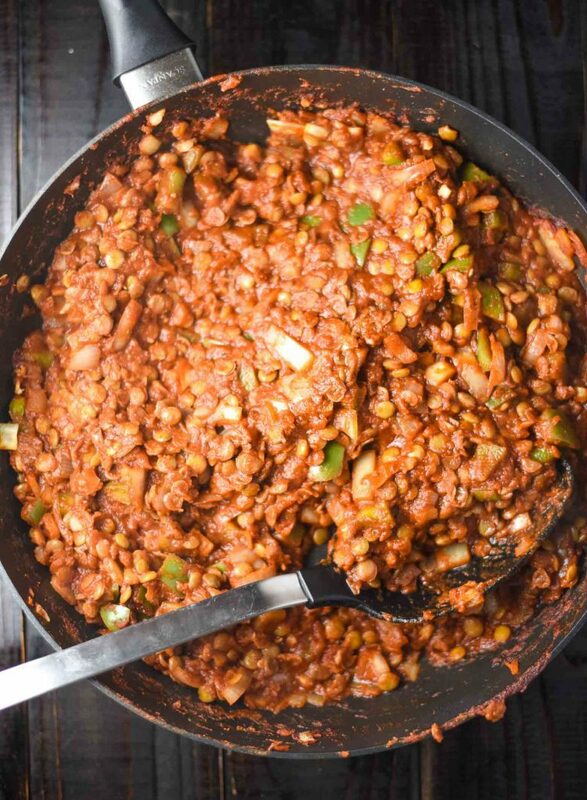 When the lentils are finished, drain any excess water and add them to the tomato sauce and veggies. Cook about 10 minutes until the sauce thickens and the flavor begins to meld. That’s it! To serve, toast the buns and add sliced onion rings and pickles plus whatever other toppings appeal to you. what is the history behind the sloppy joe? The United States of America lays claim to sloppy joes, although they’ve gone by a plethora of names over the years. References to sloppy joes as sandwiches began in the 1940s. Over time, they’ve also been known as toasted deviled hamburgers, chopped meat sandwiches, Hamburg a la Creole, and Minced Beef Spanish Style, to name a few. They differ primarily from other loose meat sandwiches due to their tomato sauce base. what should i serve with sloppy joes? You can’t go wrong with basic condiments. Onion rings are a good match, as are pickles. As a side, you can pair with a basic salad, corn on the cob, fresh roasted carrots, or even brussels sprouts. For a drink, beers match well with the simplicity of the recipe, but if you want to elevate your dinner with a glass of wine, scroll on for pairing suggestions. Interested in other vegan remakes of childhood food classics? Check out vegan spaghetti and meatballs, vegan biscuits and gravy, vegan spinach dip with kale, and cauliflower buffalo wings. If you make this recipe, leave a comment, rate the recipe, take a picture, and tag it #plantandvine on Instagram. Rioja: made from the Tempranillo grape, this wine offers a juicy, red fruit base with some smoky undertones to complement the sauce. These wines have enough structure to support this recipe. Malbec: Plum, blackberry, tobacco, and vanilla flavors. Full-bodied with a medium amount of tannins, this wine pairing is all about adding a luscious fruitiness to your meal. GSM Blend: Grenache-Syrah-Mourvèdre blend from Northern Rhône. Because the grapes are blended, you can expect a smooth mix of strawberry, plum, tobacco, and some smoky elements, depending on the mix. If you’re interested in learning more about how to pair wine with vegan recipes, visit my wine pairing and vegan wine guides. Or, if you already have a bottle of wine and need the scoop on how to decant, check out the best wine decanters. 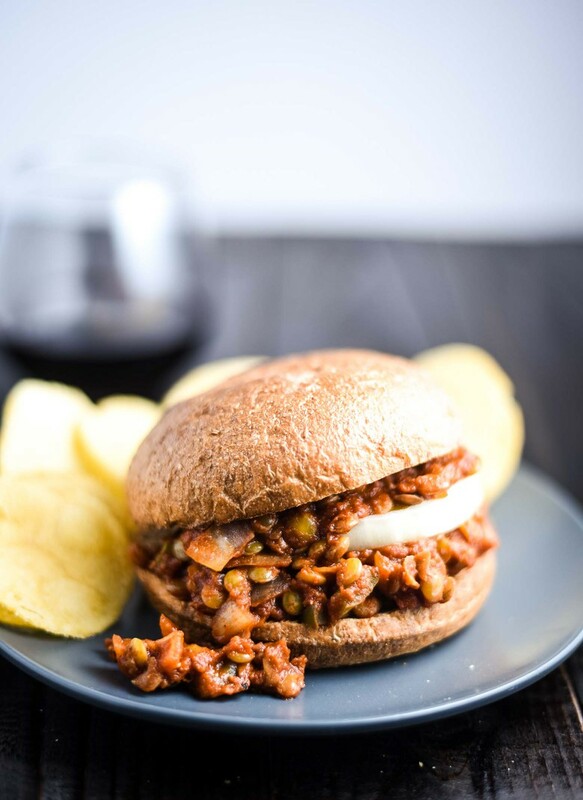 Easy vegan sloppy joes with lentils instead of beef and a flavorful, smoky tomato sauce. Add water and lentils to medium saucepan and heat over medium-high heat. Bring to a low boil, then reduce to a simmer and cook uncovered for about 18 minutes, or until tender. When tender, drain excess liquid and set aside. While lentils are cooking, heat a large skillet over medium heat. Once hot, add olive oil, onion, garlic, and bell pepper. Season with a healthy pinch of salt and pepper. Sautè for 3-5 minutes, stirring frequently, or until the peppers and onions are tender. Add tomato sauce, tomato paste, sugar, Worcestershire sauce, chili powder, cumin, and paprika. Stir until evenly distributed. Add cooked, drained lentils to the skillet and stir until evenly coated in the tomato sauce. Continue cooking over medium-low heat until sauce begins to thicken, stirring occasionally – about 10 minutes. Throughout this cooking period, taste and adjust flavor as needed. I added more chili powder, smoked paprika, cumin, and salt. Serve the mixture on toasted buns with sliced onion, pickles, and hot sauce (all optional). Store leftover sloppy joe mixture in the refrigerator up to 3 days.